The New York Metropolitan region’s premier cycling event, the fourth annual Campagnolo Gran Fondo New York (GFNY), is slated for Sunday, May 18th and will cap an exciting weekend of events and racing taking place in New York and New Jersey. GFNY is also hosting the popular Fourth Annual NYC Bike Expo May 16-17 at the Lexington Armory in Manhattan. Thousands of cyclists from more than 70 countries including the United States, Italy, United Kingdom, Brazil, Canada, Germany, Russia, Jamaica, Israel, and Poland, among others, will gear up for the Campagnolo Gran Fondo New York, a competitive cycling event based on the popular Italian racing style and the only one of its kind in the New York/New Jersey region. This year, Stephen Roche, winner of the triple-crown of cycling (Tour de France, the Giro d’Italia and the World Championship in one year) and Nelson Vails (NYC native and 1984 Olympic silver medalist in the Cycling Sprint) will ride in GFNY. The challenging and scenic 100-mile race takes place the morning of Sunday, May 18th. Riders will begin on the New York City side of the iconic George Washington Bridge and wind through the course in New York State and New Jersey that extends up to Bear Mountain State Park, with a new finish line at Ross Dock Picnic Area, the riverfront area in the Palisades Interstate Park in Fort Lee, NJ. Cyclists also have the option of partaking in the 50-mile GFNY Bear on the same day, a non-competitive ride starting at the George Washington Bridge to Bear Mountain to celebrate the park’s 100th anniversary. The 2014 race course can be viewed here: www.granfondony.com/course. The top three men and women will take home prizes, as well as top riders in specific categories including male and female age groups and teams. While the concept of GFNY is rooted in the Italian cycling tradition, the race involves multinational riders ranging from amateur to elite. After successful and internationally acclaimed races in 2011, 2012 and 2013, GFNY has become a destination for thousands of cyclists drawing a spectrum of enthusiasts including CEOs, persons with visual impairments, amputees, firefighters, teachers, and even several cycling champions. “I’m excited to be back in my hometown New York City to participate in Gran Fondo New York. My passion for cycling was developed riding on the streets of Manhattan and I hope that competitive cycling takes more of a foothold in the Big Apple. It’s a great sport for all ages. I look forward to the challenge of Gran Fondo New York and the thrills that this race has to offer,” said Nelson Vails. Campagnolo Gran Fondo New York continues to grow bringing positive cultural and economic impact to the region. The course highlight is the scenic and rigorous Bear Mountain or “Montagna dell’Orso.” Riders will get a boost from cheering spectators in the Rockland County towns that the course travels through. At the GFNY Finish Area at Ross Dock, Stephen Roche will be available for photos and autographs, and will also go on stage to award prizes during the race’s awards ceremony. In addition to the race, the Fourth Annual NYC Bike Expo will take place at the Lexington Armory, on 26th Street, on May 16-17 from 11am-8pm. Race sponsors (including Campagnolo, Lexus, PowerBar, Vespa and Elite), along with other vendors in the food, wine, and automotive sectors (among others), will be on hand to showcase their latest products. The expo is a stand-alone event organized by GFNY that is open to the public and draws thousands of visitors. Attendance is expected to surpass 10,000 individuals. GFNY continues its partnership for the third year with Operation Smile, an international children’s medical charity that provides funding for essential medical procedures that help children born with facial deformities in over 60 countries. Operation Smile will serve as the official charity of the 2014 GFNY. Participants are able to raise money for Operation Smile and receive special benefits. To learn more about Operation Smile and GFNY’s partnership, please visit www.operationsmile.org/granfondo. The race will expand globally with GFNY Italia, GFNY Cozumel-Mexico, GFNY Puerto Rico, GFNY Barcelona, GFNY Colombia and GFNY Brazil- the first events of the newly-founded 2014/15 GFNY WORLD series. The organizers of Campagnolo Gran Fondo New York created the GFNY WORLD series for two reasons: to bring the spirit and quality of GFNY to other parts of the world and to provide GFNY participants the opportunity to get their GFNY fix more than just once a year. Gran Fondo New York was founded in 2010 by avid competitive cyclists with a mission to bring Italian cycling culture to the New York and New Jersey region and to raise the profile of competitive cycling in the United States.Gran Fondo New York is open to elite cyclists and anyone who loves to ride. 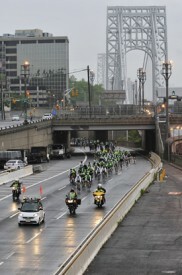 The official Gran Fondo New York website is: www.granfondony.com.